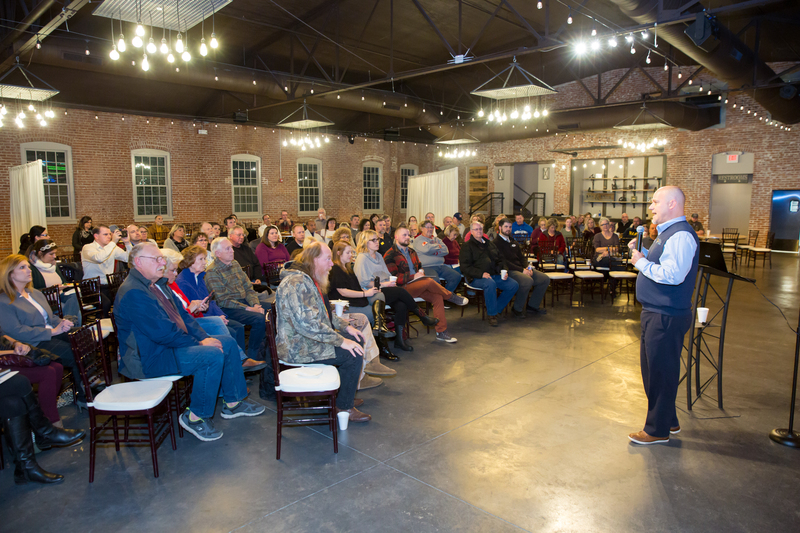 Over 100 people filled the Beck Event Space Tuesday night, not only with their bodies but with their hopes, their dreams and their vision for the Historic Harrisonville Square. The meeting, put on by Love the Harrisonville Square and Missouri Main Street Connection, brought together a colorful cross section of the Harrisonville community, with business owners, real-estate owners, lawyers, elected officials, plenty of residents and a few interested individuals from the surrounding area. Harrisonville City Administrator Happy Welch got the event started as he welcomed those in attendance and shared the mission of LTHS, the non-profit organization put together to spearhead the revitalization effort. After giving his introduction, Welch introduced MMSC State Community Development Coordinator Keith Winge. Winge, full of excitement for the event, quickly introduced MMSC to those in attendance and shared their mission for the Harrisonville square. He spoke about the organizations plans to revitalize the square, connect community programs with downtown professionals and return the area to community self-reliance and local empowerment. “Let’s turn downtown into that recruitment tool, into that quality of life piece,” Winge said. To turn these words into a reality, Winge said the organization will utilize a comprehensive four-point approach to revitalizing downtown Harrisonville. The plan features the community at the center, surrounded by the four points of Civic (Organization), Physical (Design), Social (Promotion) and Economic (Econ/Vitality). The Civic point, is applied by bringing the community together to build consensus, volunteer, invest, partner and add resources to the downtown Harrisonville revitalization efforts. The Physical point, is applied by working with property and business owners and partners to enhance downtown Harrisonville’s physical appearance, while preserving the community’s historic identity and character. The Social point, is applied by working with partners and the community to position downtown Harrisonville as a center of community activity, promote its positive image and market its unique assets. The Economic point, is applied by working with existing and potential businesses, property owners and partners to strengthen and grow the local economic base. Winge used numbers to back up the organizations approach and the growth it has brought other downtowns throughout the state. Citing the $695 million in private investment, $145 million in public investment, 627 new businesses, 3,270 new jobs and 321,519 volunteer hours, which the Internal Revenue Service values at $6.9 million dollars. During the presentation, Winge also introduced MMSC’s eight guiding principles to successful downtown revitalization, which are as follows: Comprehensive, Incremental, Self-help, Partnerships, Builds on existing assets, Quality, Change and Implementation-oriented. Over the next two years, Missouri Main Street Connection will provide LTHS with training and mentoring to establish a revitalization effort focused on preserving the historic buildings that provide charm to the original shopping district, capitalize on increased interest in the square to facilitate change and build community partnerships to increase participation with the organization and interest in the historic district. After the presentation, Winge had those in attendance form groups to discuss how Harrisonville could implement each of the four points. Groups met for 15 minutes before reporting back with their top five ideas. At the end of the meeting, Winge reminded residents that the process will take time and placed Harrisonville in the Catalyst phase, or start-up, of the renovation. He says the transition to the Growth phase, which begins handling larger projects, will not happen overnight but is coming and will ultimately lead to the Maintenance phase, which is the overall goal for the revitalization of the Historic Square. Winge closed with a quote from cultural anthropologist Margaret Mead. For more tools and information about Missouri Main Street Connection, click here.